The question of what CNS oxygen exposure is safe can spark heated debate among technical divers. This reflects the seriousness of CNS oxygen toxicity when diving. This blog post sidesteps that debate, and focuses solely on how Shearwater dive computers calculate the CNS value. The CNS display is a tool for managing the risk of oxygen exposure. Understanding this tool is an important step in making informed decisions. This table can be read as “at a PPO2 of 1.0 ata, the maximum single exposure time is 300 minutes”. So for example, if you breathe a PPO2 of 1.0 for 30 minutes, this will increase your CNS value by 10% (30/300). 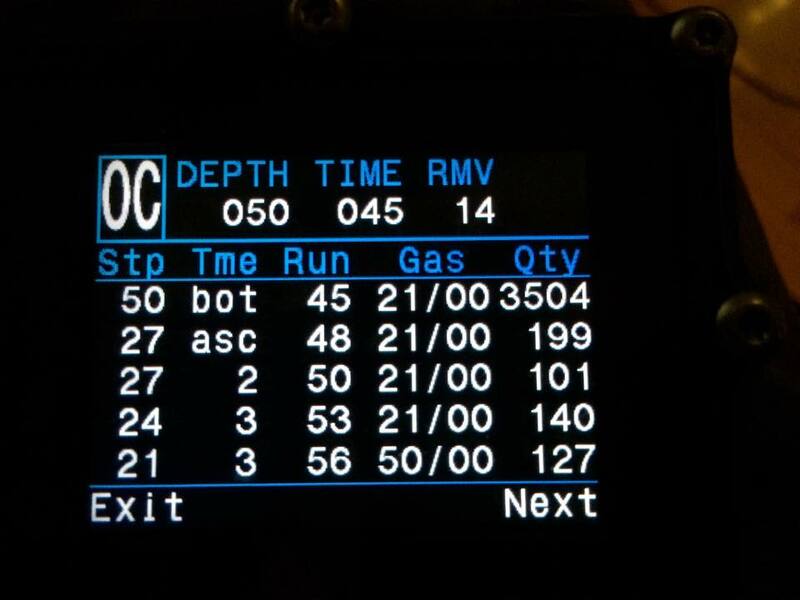 Since the PPO2 will vary during a dive, this exposure is continuously calculated and added up. So if you then spent just 15 minutes at a PPO2 of 1.60 ata (45 minute maximum exposure limit), your CNS would increase by 33% (15/45) to a total of 43%. During a dive the CNS never decreases. When back at the surface, a half-life of elimination of 90 minutes is used. So for example, if at the end of the dive the CNS was 80%, then 90 minutes later it will be 40%. In 90 more minutes it will be 20%, etc. Typically after about 6 half-life times (9 hours), everything is back close to equilibrium (0%). Since the NOAA manual only gives CNS time limits at a few PPO2 values, between these points we linearly interpolate the time limits. Also, the table only goes up to a PPO2 of 1.60, so above this we extrapolate the rates. I have attached a graph showing these values. 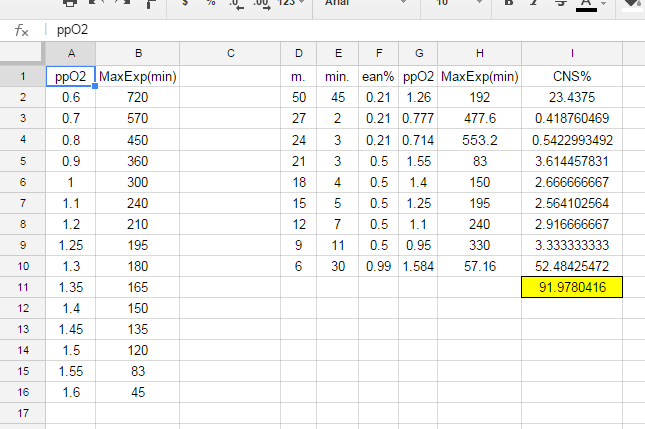 Note the data point for a PPO2 of 1.65 is not given in the NOAA manual, but instead has been extrapolated out. You can see that even small increases of PPO2 above 1.6 cause the allowable exposure time to decrease dramatically. Above a PPO2 of 1.65 ata, the CNS rate increases at a fixed rate of 1% every 4 seconds! This is fast, but is derived from the widely used NOAA values. United States. National Oceanic and Atmospheric Administration. 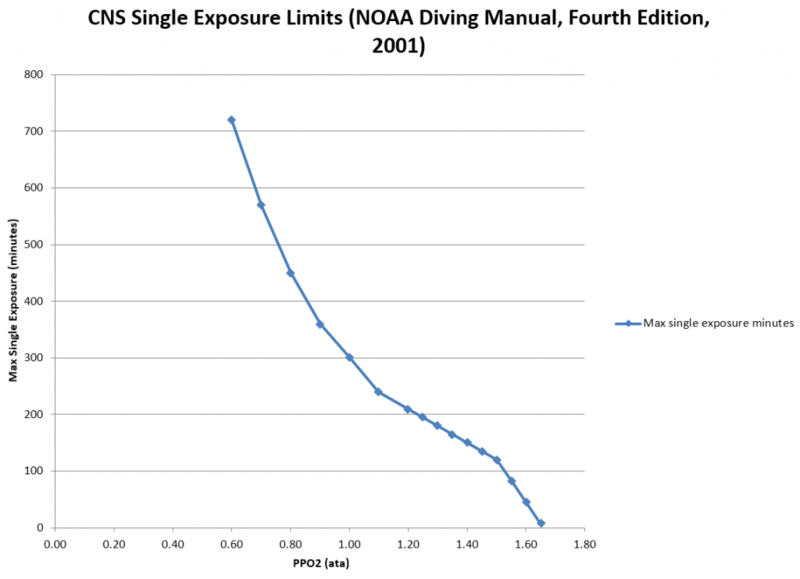 NOAA Diving Manual, Fourth Edition. Ed. James T. Joiner. Flagstaff: Best Publishing Company, 2001. Print. I am the Engineering Manager at Shearwater. With a background in electrical engineering, I work with a committed team to keep Shearwater products reliable and easy to use. I’ve a question for you about CNS and this article is timed perfectly! eheheh Some weeks ago i’ve noticed a difference between planning a dive on my Shearwater Petrel and a software (PastoDeco App), the same dive (45 minutes at 50 meters with GF 30/80) give me different CNS percentages and then i asked myself how it exactly work on the petrel (i know how it works on the PastoDeco App, that uses interpolation and proportions on the NOAA table). The Petrel give a lower CNS and i thought that the proportions were not linear (like 30 minutes on 1,6 ppo2 isn’t really 66,6% CNS) i thought that the CNS curve isn’t linear but rather something “exponential”. Then i saw this article and i’ve tried to do some interpolations and proportions like it seems works also on Petrel, here it is my results. 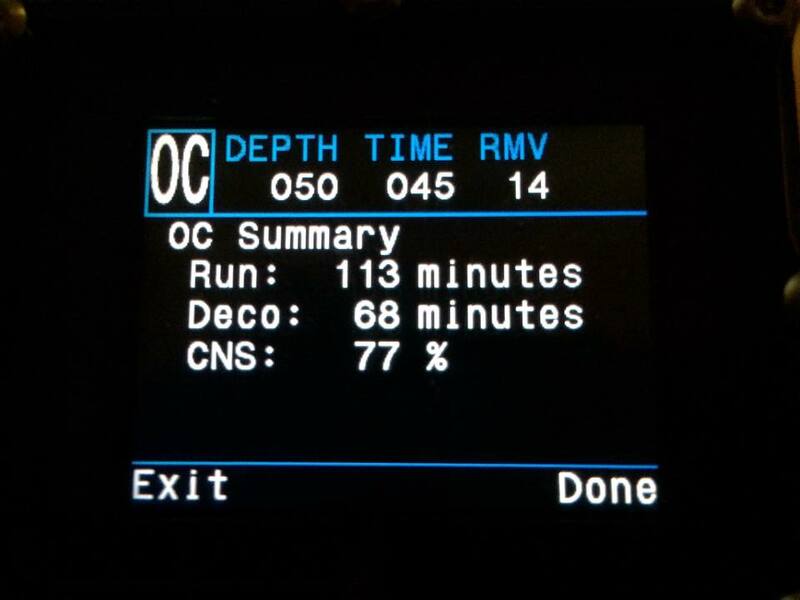 Almost 92% of CNS (and without the ascention time). I’m interested and curious to understand how it works, Thanks a lot for you time! I think your understanding of the calculations is correct. In the example you presented, my guess is that what we are seeing is the steep slope around 1.6 is resulting in small variations causing relatively large changes in final CNS. 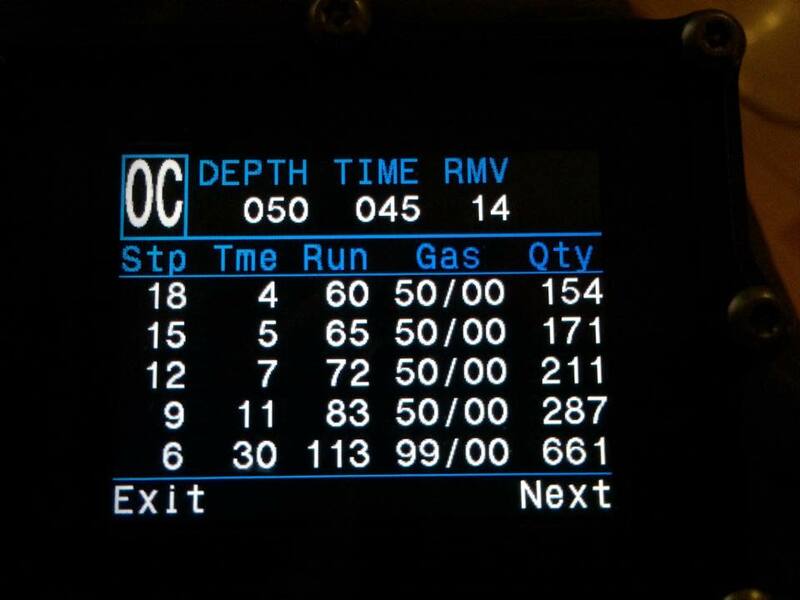 The dive plan shows fixed depths (in meters), but CNS calculations are based on pressure. Several factors affect the conversion between pressure and depth. – Water density. You will see the CNS change a few percent when switching between the Fresh and Salt settings. Of course, set it to water type you are actually diving. – Surface barometric pressure. When at high altitude the surface barometric pressure is lower. Weather systems can also affect barometric pressure. You can see the current reading on the Petrel by pressing the right button a few times. Check these two values and report back. For reference, I get 91% CNS planning your dive on the Petrel with Salt water and Altitude set to SeaLvl. First thanks a lot for the response! Here it is the values: i set fresh water and the barometric pressure is 1004 mBar. Why the CNS change with salt or fresh water? the value of the pressure isn’t it the same at the 40m in the fresh water setting and at 40m in the salt water setting (it change only the real depth, no?)? And finally, is it possible that the water setting change 20% of CNS? The CNS % calculations are very sensitive to these small variations in pressure around 1.60. Whether or not there is any physiological impact of these changes is another more complex topic. Now i’ve set the salt water and sealvl, but the CNS is 79% (versus the 77% of before).. Not 91%, i use the Bullhman algoritm 🙂 thanks! I have a loged dive in my shearewater with an cns of 144 %. How is this posible? My buddy, same dive has an cns under 100%. Hello, Bart. There are several reasons why you could have ended such a high CNS. The best way for us to determine a cause would be to have access to your dive log and your buddy’s. We would only need the dive data for this one dive in particular. On Shearwater Desktop you can select the dive in question and export it as a csv file (File>Export Dive…). You can then send us the files as attachments to info@shearwater.com along with your question about your CNS levels. With this information from both dives we can gather better insights about your high CNS levels. Cheers. Hallo, my question is a bit unorthodox but I hope you will answer it.. in case of OC dive with ppO2 higher 1.65 bar, how is CNS Oxygen Toxicity calculated? Hi, Rajko. Above a PPO2 of 1.65 ata, the CNS rate increases at a fixed rate of 1% every 4 seconds! This is fast, but is derived from the widely used NOAA values.